he art of Palekh is a part of the world culture. 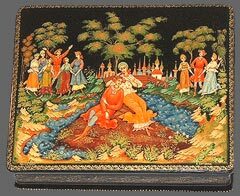 Lacquer miniature which appeared in the beginning of the 20th century oil the basis of old Russian painting brought Palekh a world fame. 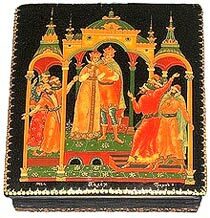 Before that for 3 centuries Palekh was known in Russia as one of the great centers of icon-painting. After the revolution of 1917, because of persecution religion, former painters started to look for new jobs where they could use their experience. The decision was found thanks to a unique talent of Ivan Golikov and a talent for organisation of his brother-in-law A. Glazunov. Using experience of Lukutino miniature and art traditions of old Russian painting, Golikov started to create miniatures. His charming and original works fascinated his former colleagues. Even their first works found a broad response among experts and public in Russia and abroad. First exhibitions of Palekh in Paris and Venice made a sensation. 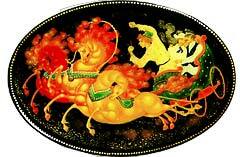 Golikov's miniatures, in spite of their small size, expressed a spirit of time rather well. His couples, troika driving, rendezvous, dances, battles, beautiful in form and colour, were full of dynamic rhythm, reflecting the time of rapid changes. 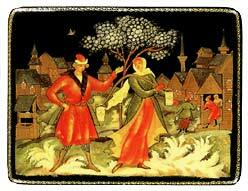 In 1924, seven Palekh artists have founded Old Painting Artel. 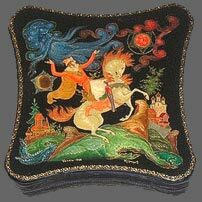 Thus a new page in the history of the craft has been opened, and soon lacquer miniature got world recognition. 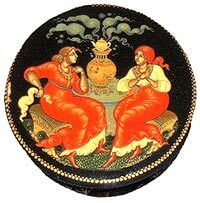 Folklore way of thinking, richness of content, figurativeness - that's a typical feature of the traditional Palekh art. Folklore energy always fed and is still feeding the art of miniaturist-painters. Genre motifs, as a rule, have retrospective character, it is not only the tribute to historical memory, poetization of the past, but a search of harmony in eternal themes in which is expressed the charm and appeasing beauty of ordinary human deeds and fun. Classical literary works toward which every generation of Palekh painters turns their attention every time sound differently when expressing our reality. Every time well-known masterpieces find new life. Every artist «reads» one and the same fabula differently and adds not only his emotional perception and professional fulfillment but also makes image in his own way, introduces different nuances, thus reaching a sharp contemporary expression of a theme. As far back Goethe, speaking of his understanding of art mentioned that painters using the same fabula and characters as before change and transform them in a new way. Having received during Perestroika the freedom for creative work unseen before, painters used this freedom differently. Elder generation of high professionals remained loyal to classical themes: folklore motives, literary sources. They are devoted to lofty perception of life and their works are poetical images of the world. 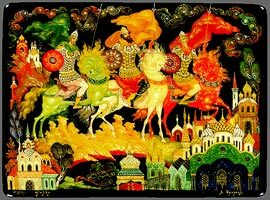 Mastering Palekh painting technique is a durable and hard work which permits to create painting corresponding to a high image of Palekh. Learning at Palekh art school for 5 years, future artists get to know elements of the craft and only later, after many years of work together with experienced teachers, step by step, they master the essence of the image structure of the Palekh miniature, certainly mastering the painting technique. Future artist starts his training from copying the works that lets him to bring the painting skill to perfection. At the same time, he tries to create his own composition, developing the image-bearing way of thinking. Without it a painter is condemned to make merely copies, only changing and modifying them a little. 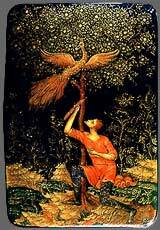 Majority of Palekh painters being believe: even in the soviet times, turned back to icon an miniature painting of Biblical content.Turning to icon-painting is a complex process not only for Palekh. 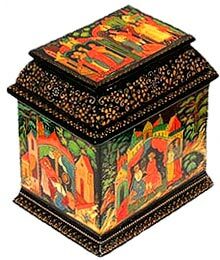 If creation of the unique center of lacquer miniature which made Palekh world famous happened thanks to the high style of old Palekh painting, then the revival of icon painting is taking place thanks to preservation of icon painting technique in miniature, spiritual harmony of its image. Russian Orthodox icon is inexhaustible, rich material having no analogues. This experience and life itself prompt understanding of icon image to the painter. 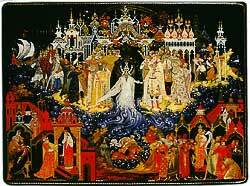 Gromov.N "As the pike orders"
N.Gromov "Tale of Tsar Saltan"
T.Korneeva "The Tale of Peter and Fevronia"